There are so many iterations of Drunken Shrimp – and none of them please me. So here’s mine. Think of this as Drunken Shrimp a la Margarita Style. As it should be. For health and lifestyle choices I use all organic ingredients – and most especially wild-caught shrimp – but conventional products will work equally well. Combine tequila, orange juice, lime juice shallot, garlic cilantro and red pepper flakes in large ziploc bag or bowl. Add shrimp. Marinate in refrigerator 1 hour. 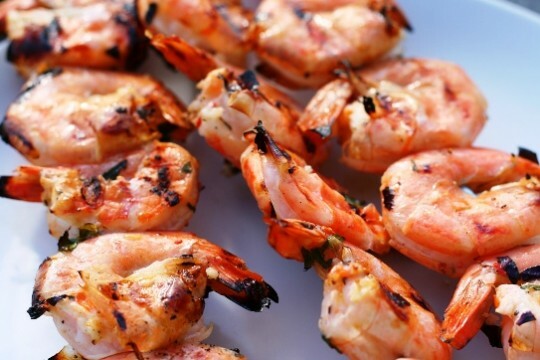 Add shrimp to skewers. Season to taste with salt and pepper. Grill over medium heat 3-4 minutes. I like to sauté mine with minced garlic & jalapeño, then pour in the tequila at the last minute. Flambé and serve with rice, black beans, and avocado.